John McGinn has “every right” to pursue a move to English football, according to his Hibs team-mate Steven Whittaker. The Easter Road club have rejected a bid in the region of £750,000 from Nottingham Forest for McGinn but the English Championship outfit, managed by former Rangers boss Mark Warburton, are expected to return with an increased offer before the transfer window closes tomorrow night. Whittaker believes the departure of McGinn would represent a “massive loss” for Hibs at this stage of a season which they have started so promisingly on their return to the Premiership. 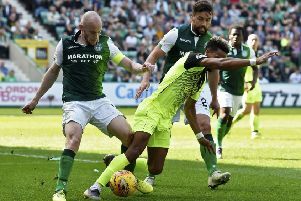 But defender Whittaker, who returned for a second spell at Hibs this summer after five The Easter Road club have rejected a bid in the region of £750,000 from Nottingham Forest for McGinn but the English Championship outfit, managed by former Rangers boss Mark Warburton, are expected to return with an increased offer before the transfer window closes tomorrow night. But defender Whittaker, who returned for a second spell at Hibs this summer after five years in English football with Norwich City, believes the ambitions of 22-year-old McGinn must be respected. Whittaker, who is joined by McGinn in the Scotland squad for the World Cup qualifiers against Lithuania on Friday and Malta next Monday, has no fears about how the speculation over his future will affect the midfielder. “He won’t be fazed by it at all,” added Whittaker. “He definitely has the right attitude. If he does make the kind of move which has been spoken about, he will go on and do well.